House A large four storey collectable dolls house with eight rooms. It has a large central stair case, attractive detailed fascia and railing and step detail. There is four separate hallways with space for internal doors. It comes complete with stair railing kit. The Beaches dolls house kit is precision manufactured from good quality MDF and is supplied flat packed and un-decorated and has an ideal surfacing for decorating. Full assembly instructions are included with this dolls house kit. 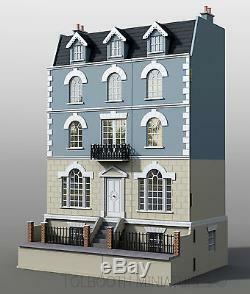 Dolls House Specifications (H x W x D) 930 x 750 x 380 mm. Basement A front opening Dolls House Basement with central stairs leading down to the pavement. It has two internal rooms and a hallway with space for internal doors. There is a side window on each side. Comes complete with cills and pavement railings. The Beeches Basement kit is precision manufactured from good quality MDF and is supplied flat packed and un-decorated. Great surface for decorating on. Comes with full assembly instructions. Overall sizes (H x W x D) 214 x 750 x 576 mm. Please order early in plenty of time as unexpected delays can happen. In the event of any delays you will be notified as soon as possible. In the event of any visible damage to the packaging; the item must be refused and not signed for. Failure to adhere to either of these stated conditions mean any problems arising after this time will be chargeable. The item "Beeches Dolls House and Basement 112 Scale Unpainted Collectable Kits" is in sale since Wednesday, September 13, 2017. This item is in the category "Dolls & Bears\Dolls' Miniatures & Houses\Dolls' Houses". The seller is "tolboothminiaturesltd" and is located in Falkirk, Falkirk. This item can be shipped to United Kingdom, Austria, Belgium, Bulgaria, Croatia, Cyprus, Czech republic, Denmark, Estonia, Finland, Germany, Greece, Hungary, Ireland, Italy, Latvia, Lithuania, Luxembourg, Malta, Netherlands, Poland, Portugal, Romania, Slovakia, Slovenia, Spain, Sweden, Australia, United States, Canada, Brazil, Japan, New Zealand, China, Hong Kong, Norway, Indonesia, Malaysia, Mexico, Singapore, South Korea, Switzerland, Taiwan, Thailand, Chile.